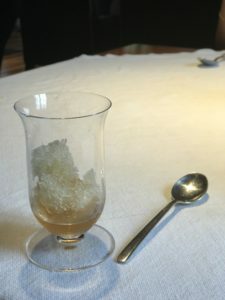 We’ve always held The French Laundry (TFL) close to our hearts as our most memorable and historically significant meal. We had been dating for only a year when we collectively called the reservation line 110 times before getting through on the very last dial and securing our reservation. That level of tenacity scored us a reservation exactly one year to the day that we met, which was the point of the celebration! We were so excited to be enveloped the charm of Thomas Keller in gorgeous Yountville on a milestone date such as the anniversary of “us”. Our last visit to TFL was October 2013. Fast forward to September 7th 2017, we found ourselves sitting down to an extraordinarily charming lunch at Asador Etxebarri when a flood of memories came rushing back drawing a parallel for us to The French Laundry (mostly based upon location, ambience and charm. The menus are vastly different.) 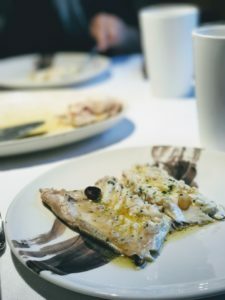 Only this time, we were in the gorgeous foothills of Atxondo of Northern Spain inside a darling cobblestone cottage under the care of Chef Victor Arguinzoniz. As we enjoyed our 16 oceanic and primal courses, we had a perfect view of the mountains and cobblestone road. Every so often, we’d glance up to see sheep being herded down the road to the pasture while mist rolled across the mountainous landscape. Without a doubt, this was the most romantic lunch we’ve had in forever; arguably since TFL. Gorgeous cobblestone drive and cottage-style house. Front entrance to Asador Etxebarri. 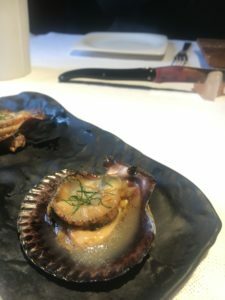 Lunch in Spain is an all day event, but for some reason, we weren’t privy to this! 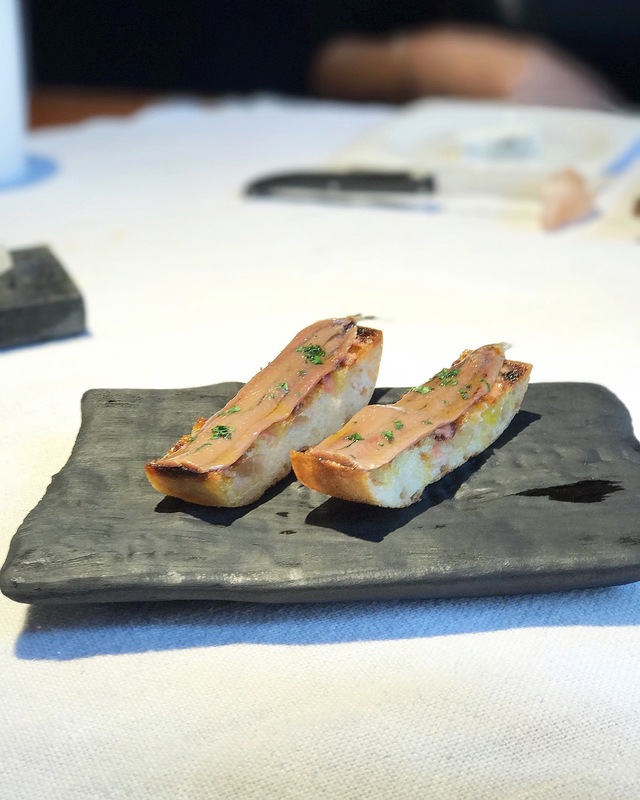 In an endearing location like Etxebarri, there is no good reason to be in a hurry. Even if the sole thing you’ve accomplished for the entire day is just eating lunch, there’s still no reason to rush it. We were seated at 1:30 PM and walked out of the restaurant close to 5:00 PM. Given the landscape is entirely captivating, be certain to build in time before and/or after the meal to drive through the countryside in addition to walking the grounds and observing the sheep graze while admiring the ornate architecture. 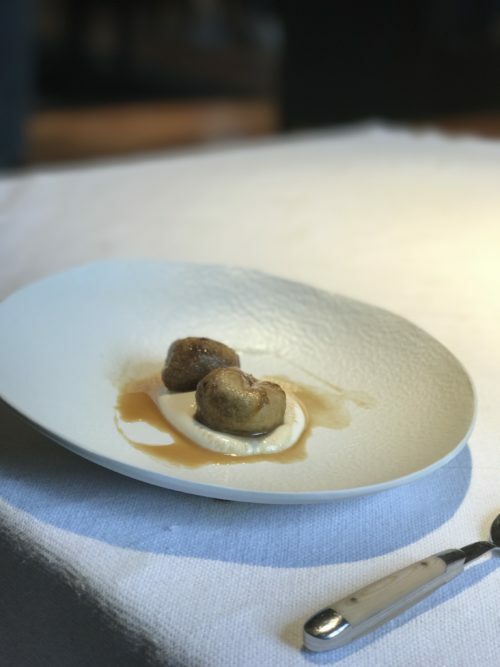 At Etxebarri, the simpler the dish, the more profound it is. Each ingredient retains original flavor and integrity given that Chef Victor Arguinzoniz has mastered the art BBQing at the right temperature for the right duration. His tasting menu is constructed of products from the ocean, farm & garden, all lightly kissed by open flames. Below are all 16 courses served on September 7, 2017 with a brief description of each dish. 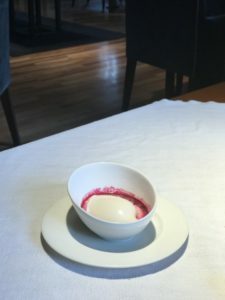 The most interesting discovery of the journey was realizing at the end that the receptors of the tongue that signal sweet remained dormant for the duration of the meal. This was a welcome change for a fine dining experience. We enjoy sugar just as much as the next person, but adding sugar is like taking the easy way out. Ingredients like bacon, sugar, salt and butter win most people over because they trigger dopamine in the brain – surefire pleasure. 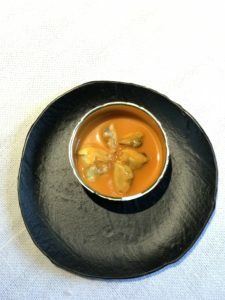 Try avoiding those ingredients and still bring something extraordinary to the table, not an easy feat, but Victor seems to have mastered the ability to keep it simple without compromising flavor. Amateur cooks (like E.B. Woodward at home) cannot accomplish this, but Chef Victor seems to have figured it out delivering an experience that has landed him the No. 06 position on The World’s 50 Best Restaurants for 2017. ‘Cracker & Chorizo’ an abbreviated charcuterie board. ‘Butter Goat’s Milk’ barely salty, very firm yet velvety for use with bread service. Hold a little back in the event something shows up later that you want to experiment with. We’re always curious and create unique bites along the way. ‘Salt Anchovy’ atop toasted bread. 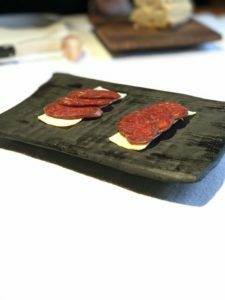 A Michelin One Star spin on pintxos. ‘Tomato & Belly of White Tuna’ The delicate flesh of the tomato made this dish outstanding. 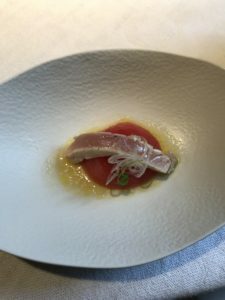 Each bite of tuna melded wonderfully with the acidity of the tomato. ‘Mussels’ and traditional sauce (mariniere). ‘Chlamys Varia’ the most oceanic (borderline aquatic) bite of the day. Flipping the shells over, sand and barnacles still attached. Doesn’t get any fresher. ‘Baby Squid’ with its own ink and caramelized onion. Delicate, tender squid, barely kissed by an open flame. Ink that has been prepared in a way that tones down the bitterness of the ink-flavoring creating nice depth to each bite. 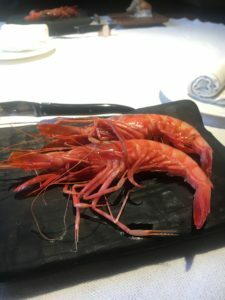 ‘Prawn’ of Palamos. Be prepared to prepare your own shrimp. Very Romeo and Juliet in their presentation. When this arrived, I (Erin) hummed to myself Elton John’s “Funeral For a Friend” as we declared Brandon the “Shrimp Butler” tasked with dismantling four blanched bodies. They were quite tasty once reduced to flesh. 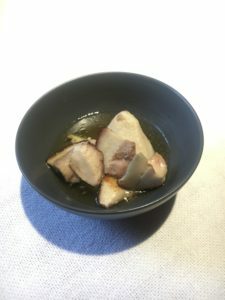 ‘Ceps & Aubergine’ mushroom caps, fleshy, porous, earthy. 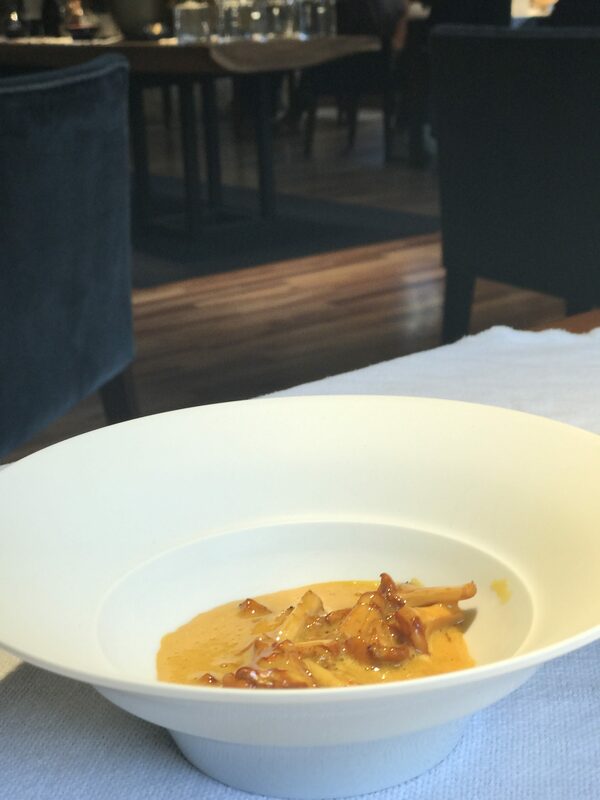 ‘Scrambled Eggs & Chanterelle’ wonderful marriage of egg and woodland mushrooms. Savory and rich with faint hint of apricots. ‘Kokotxa of Cod’ cheek of the cod. 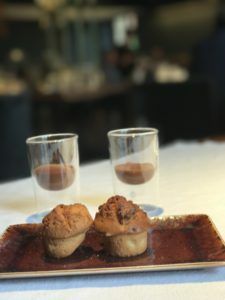 Has a slight give and a texture that mimics sweetbreads with an entirely different flavor profile. ‘Red Sea Bream’ meaty fish, thick in consistency rather like tender-roasted chicken in texture opposed to white fish. Entirely lovely. 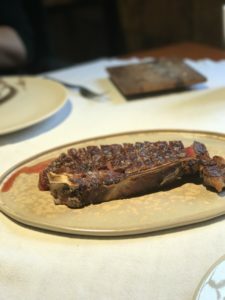 ‘Beef Chop’ freshness of bovine, iron flavor (which we love) prepared at Rare+ temperature. A charred outer crust with rare center. ‘Palate Cleanser’ neutral, icy nectar. As we moved into the sweet section of the afternoon, one aspect that jumped out at us was the fact that Chef carried forward the primal, earthy-balance of the “Sweet Section” just as he maintained the integrity of the ocean and the iron-flavor of bovine as “naturalness” permeated throughout the menu. The “sweets” were entirely delicious, but we wouldn’t describe them as sweet per say. This menu is like taking a picture without using a filter and admiring the detail for exactly what is it – authentic. ‘Reduced Milk Ice Cream Beetroot Juice.’ Just as it sounds, fresh and earthy and very irresistible. ‘Fig Almond Cream’ perfectly balanced for a not-too-sweet dessert. ‘Mignardise & Cocoa.’ mildly bitter, velvety chocolate mousse and soft center mini muffins. A day of dining at Asador Etxebarri is filled with ‘understated elegance’ from the scenery, to the ambience, to the rustic charm of the restaurant, staff and ingredients. Thomas Keller is to the United States what Victor Arguinzoniz is to Spain, both chefs are perfectionist-masters of their respective domains. “A recipe has no soul. 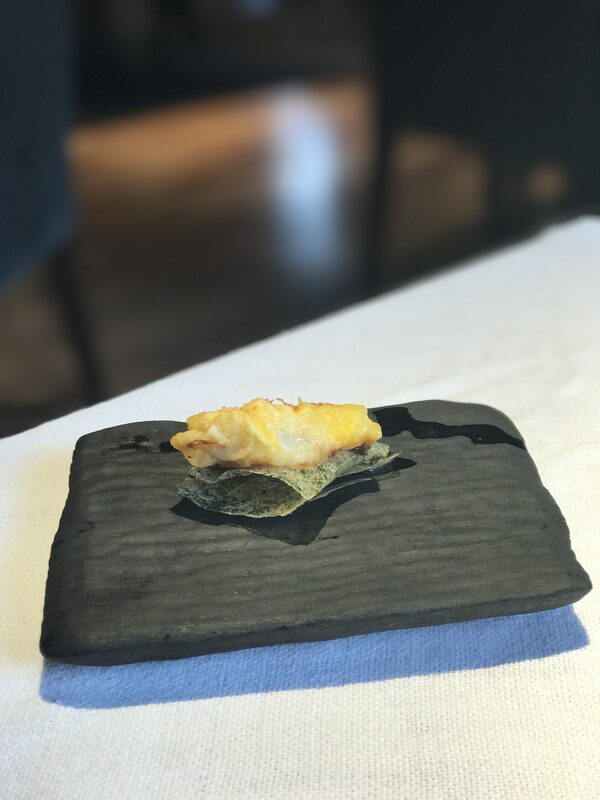 You as a cook must bring soul to the recipe.” Thomas Keller may have said it, but Victor Arguinzoniz builds little wood and charcoal fires that breathe life into every morsel of food that passes through the Etxebarri kitchen. 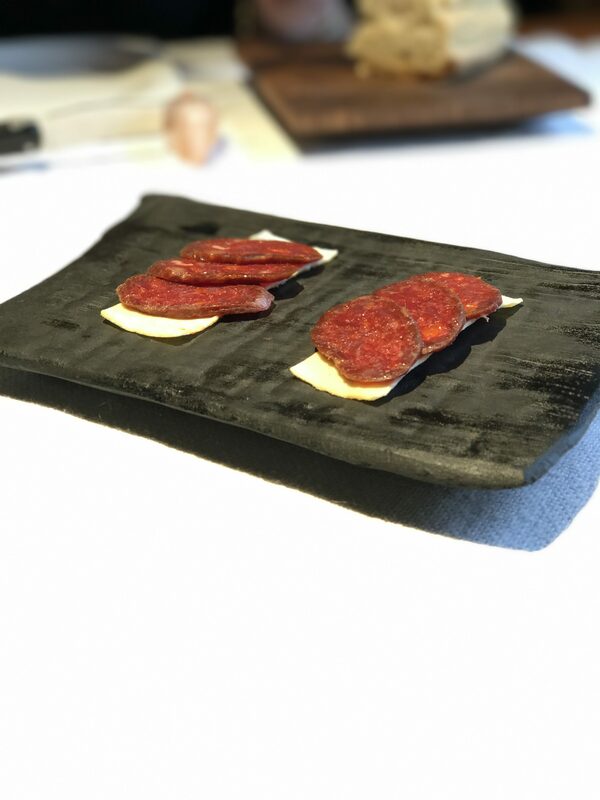 Like we said, we’ve found our Spanish French Laundry in the foothills of Axpe, Spain. Another deeply romantic meal etched into our timeline. Make reservations for Asador Extebarri by clicking here. 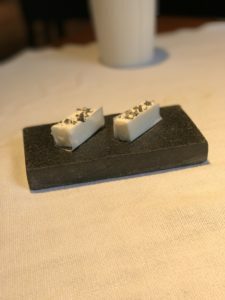 By the way, have you been to Per Se? I like that restaurant more than TFL. Great write-up as usual. I just wished the formatting didn’t shrink and butcher all your pictures. The ones you have been sharing on IG look glorious at the proper size. 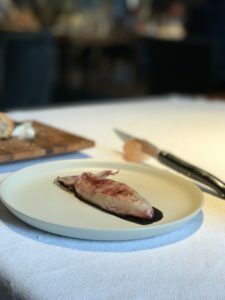 For example, the baby squid and ink course that appeared as though it just came straight out of the sea!